Last week, Kobe Bryant took his first baby step into entrepreneurship by announcing his investment in BodyArmor, a relatively new sports drink company that has already built up an impressive stable of athlete endorsers in LeSean McCoy, Rob Gronkowski, Andrew Luck, Mike Trout, Buster Posey, James Harden, and Kevin Love. Naturally, the day after the announcement, I ran over to the liquor store and bought as many bottles as I could hold. Why is this drink called BodyArmor? Great question. It’s a terrible name and I have no idea. Wow, this is off to a fantastic start. What makes it special? BodyArmor has several claims: It’s low-sodium, contains 10 percent coconut water, and has 2.5 times more electrolytes than the leading sports drinks, with natural flavors. That sounds great! Should I take their word for it? Sure, but, as you’d expect, there are embellishments made for the sake of marketing. For one, low sodium content isn’t necessarily the best thing for a sports drink. Second, one of the main electrolyte sources is magnesium oxide, which is cheaper and contains a lot more elemental magnesium than other magnesium compounds, but isn’t absorbed well in the body. In this case, having more might not actually be an upgrade. I think coconut water is kind of gross. Is the flavor noticeable? Not really. It peeks out at the end of a sip. It doesn’t play a role in the drink flavor, or in the aftertaste. It’s more of a mouthfeel thing. It’s not that discernible. 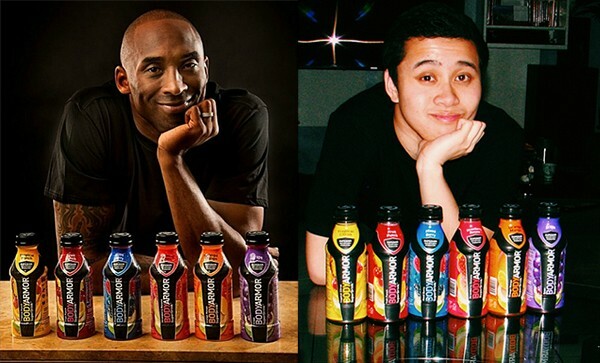 Did Kobe make the right decision by investing millions of dollars in BodyArmor? I think so. He’s working with a cofounder of Vitamin Water, which Coca-Cola bought for $4.1 billion. BodyArmor seems poised for growth in the coming years, especially now with Kobe’s involvement. There are worse ways to spend an estimated $5 million, if you have that kind of money lying around. What flavors are available? BodyArmor currently has six flavors: Fruit Punch, Orange Mango, Mixed Berry, Tropical Citrus, Grape, and Strawberry Banana. When the product first came out in 2011, it actually had weirder flavors like Raspberry Blueberry Goji and Orange Mango Black & Green Tea. It’s strange that the company would want to get rid of such interesting flavors, but it kind of makes sense. Your product might be a game-changer, but you don’t want to weird people out before they trust the product. Do they taste good? I thought you’d never ask. I bought all six available flavors and conducted a taste test. Like the sports drink industry itself, I followed a (pseudo) scientific method to reach my conclusions. I had a set of subjective criteria for the taste testing: aroma, taste at both refrigerated and room temperatures immediately after physical activity, and taste at refrigerated and room temperatures as meal accompaniment. Each criterion was set to a scale of 10, with 10 being, “You’re right, Kobe. This is absolutely going to disrupt the sports drink industry.” The individual scores were then compiled, and a composite score, out of 50, was given. Here is how the six flavors fared in my test, ranked from least desirable to most. Your opinion of this flavor was set many, many years ago, back in elementary school when you opened up your lunch box and found a Tropical Punch Capri Sun pouch staring back at you. That was the worst day of the week for me. The first split-second is solid. It hits you strong with a purple Jolly Rancher flavor on the front end, but dissipates quickly without ever giving you that essential acidic jolt. From the sip to the time it sets in your stomach, the taste gets exponentially worse. You might be able to draw parallels to grape soda, but grape soda’s magic is in how the effervescence gives life to an oppressively one-dimensional flavor. BodyArmor doesn’t have the luxury of bubbles. This is James Harden’s favorite flavor, presumably because it’s the only one that has a direct Gatorade analogue. Fruit Punch also had the greatest degree of variance in its enjoyableness as a cold beverage and a room-temperature beverage. It kind of tasted like a less-cloying Hawaiian Punch when cold, but at room temperature, it’s right there with the dregs of this list. This is kind of paraphrasing a human phenomenon brought to light by Savage Garden and Carly Rae Jepsen, but I forgot what the Strawberry Banana flavor tasted like before I tried it. It’s vaguely strawberry, with something even more vaguely bananaesque rounding out the end note. Honestly, it’s not bad. Having a forgettable flavor is maybe the best-case scenario for a Strawberry Banana beverage outside of the smoothie realm. I would absolutely drink this again if Kobe handed me a bottle. Of all the flavors, Orange Mango’s aroma was the most disconcerting. Think of the V8 Splash Tropical Blend flavor (the orange one), but with musky armpit overtones. The aroma test is done before any consumption, so Orange Mango’s rating was not off to a good start. Luckily, it fared well in both cold/room-temperature tastings. The blend skewed more heavily mango than orange, which grew on me. It tasted kind of like diluted mango nectar with some orange Tic Tacs soaking in it. To clarify, that’s a good thing. It smells like Berry Tie-Dye Fruit by the Foot. I miss being 6 years old. It’s cool to see improvements in an industry, but ultimately, BodyArmor is still disappointing in a lot of respects. You can’t beat Gatorade at its own game. You also can’t expect to gain an edge by taking half-measures. As natural as it claims to be, BodyArmor still draws upon the same unnatural flavor profiles we’ve been exposed to our entire lives. A slightly better fruit punch is still fruit punch. BodyArmor is going against a monolith that created Gatorade Frost, a product that convinced the youth of America that drinking pastel-colored liquids with names like Glacier Freeze (and every other synonym for cold things) was going to help them improve on their mile time. There is nothing natural about Riptide Rush, a Frost flavor that shares the same color as the Swiffer WetJet cleaning solution, but it’s a successful product because of unparalleled name-brand recognition (and because it tastes fantastic). There’s a sci-fi element to Gatorade’s allure, and it’s a defense that BodyArmor won’t be able to penetrate, or co-opt. Gatorade sells a story as well as its product, and the story is its greatest asset. BodyArmor takes its natural properties to create something that you wouldn’t have a hard time believing were artificial. It takes its best quality and drags it through mud. BodyArmor can brand itself a superdrink in hopes of escaping Gatorade’s shadow, but it’s still the same animal, though nowhere near the same beast. Danny Chau is an assistant editor at Grantland. Men in Blazers: With Special Guest Nicolas Batum!